William R. Anderson, US Customs Service Special Agent (Retired) and former member of the Joint Terrorism Task Force. Larry Lindsey, Retired Naval Officer, Vietnam Veteran, and Author of Stump! Former Navy Seal turned consultant Jake Palmer is in New York with his London-based love interest Fiona Collins when he has a seemingly chance encounter with a US Homeland Security Investigations (HSI) special agent. 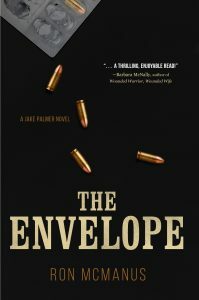 Moments later the agent is gunned down, and Palmer is left with an envelope containing a cryptic note from the agent and information related to a counterfeit medicine case involving a drug manufactured by the company where Collins works. After an unexpected event makes the case personal to Palmer, he teams with the HSI special agent now in charge of the case. Together, they pursue those behind a global counterfeit medicine and money-laundering operation. As the case enfolds, Palmer makes a startling discovery that raises his personal stake in the outcome even higher and reveals the real reason the murdered HSI agent wanted him involved. With those closest to him now in danger and more patients dying from taking a medication that contains almost none of the life-saving ingredient, time is running out. The search for answers takes Palmer to London, Rome, and the Amalfi Coast, each step moving him closer to a confrontation with one of the world’s most dangerous assassins, former Russian Spetsnaz operator Viktor Utkin. The Envelope will keep you up at night and make you question those medicines that seem to change shape and color each time you refill them.